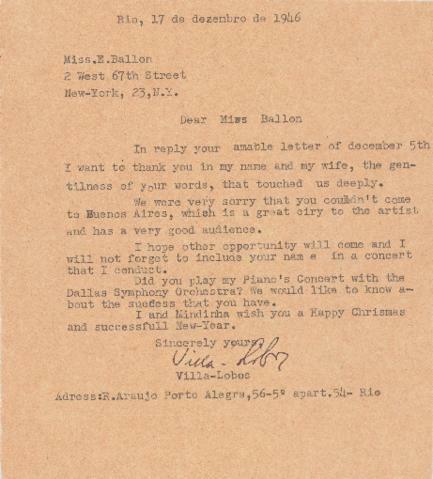 Item is a typed letter from Heitor Villa-Lobos to Ellen Ballon written on December 17, 1946. The letter acknowledges a letter Ballon wrote on December 5, 1946 and asks if Ballon performed the world premier of Villa-Lobos's first piano concerto with the Dallas Symphony Orchestra. Item is accompanied by the stamped air mail envelope in which Ballon received the letter. Two Brazilian postage stamps are affixed to the envelope. Description created by Creighton Barrett on October 24, 2017.